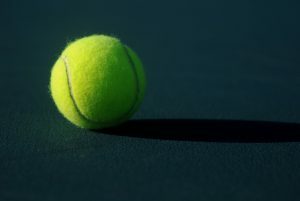 Consistently practicing your tennis strokes on a court is easily the best way to improve your tennis game. However, getting to a court can be a challenge for some people. Perhaps you don’t have the time, a willing partner to hit with, or it’s the winter months and conditions are not amenable. Maybe you just want to practice tennis alone? You can still practice your tennis game alone at home, in your garage, at a gym or even your backyard. You don’t need a partner and you don’t need a court. 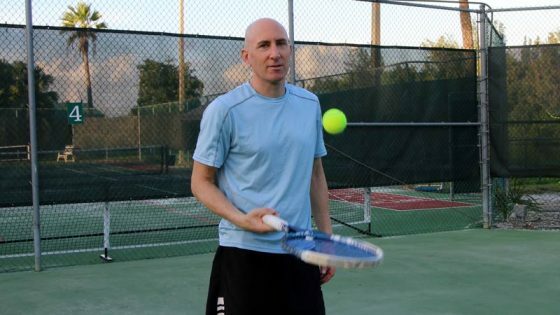 In this post, I’m going to reveal my top 10 tennis drills you can perform without a court. Many of them are tennis drills you can do by yourself, while some make use of an off-court partner. Most are indoor tennis drills, so you can do them even when the weather isn’t cooperating. These drills will help improve your game so when you step on a court, you’ll perform noticeably better. I’ll go over each drill one-at-a-time so you understand how to do it and what the particular benefits can be. I guarantee if you spend even 10 minutes per day practicing them, you’ll see a marked improvement in your tennis game. For most of these drills, all you need is a racket and a ball. So without further ado, let’s get started! This is an excellent drill for building up the forearm muscles and practicing pronation. All it requires is a racket and very little room, just a few feet of space. Simply turn your hand upside down. This will cause the racket to flip from right to left for right-handed players. This is called pronation. Continue alternating between supination and pronation until your forearm tires. Start with 10 reps and build up to at least 25 without stopping. You can add a racket weight for increased resistance. This is a great exercise to do in the morning and evening – or any free time you have. You’ll see the improved benefit in your serves and overheads. 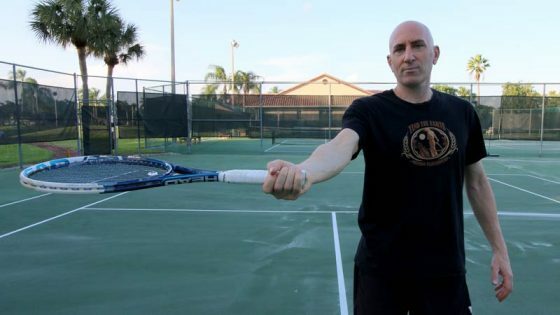 The tennis serve pronation drill is one drill you’ll want to continually do. It’s easy to do for children as well. Most club players have trouble with their serve toss. So why not practice it away from the court? If you have high ceilings, you can do this drill inside, otherwise it can be done almost anywhere outside. It requires just one tennis ball. You can choose to hold your racket in your dominant hand if you want – but it’s not necessary. Get into your normal serve stance. Toss the ball in the air with your non-dominant hand as if you were going to serve. After the ball leaves your hand, keep your arm in the air and try to catch the ball with your arm still extended (resist the temptation to turn your hand to catch the ball. Your palm should remain facing your direction). Do at least 20 tosses per session. Since this is not a strenuous exercise, you could even do 50 tosses in one session and do them twice per day. Imagine how much better your toss would be after one week or one month? 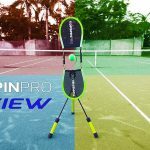 A much-improved serve toss that is more accurate and reliable. As a result, you’ll have a much-improved serve. Around half the club players I see do not have racket drops on their serve. The racket drop is the part of the serve where the racket is completely inverted in what some people think of as the “scratch your back position”. It’s very important to achieve this position to generate momentum on your swing and pace on the serve. Many people struggle with this part of the serve, as did I early in my playing days. This is one of the many great tennis drills to do alone and is fantastic at correcting that issue. Here’s how to do it. Stand in your normal serve stance with your racket in hand and hold the continental grip. Raise your hitting arm to your side with elbow bent. 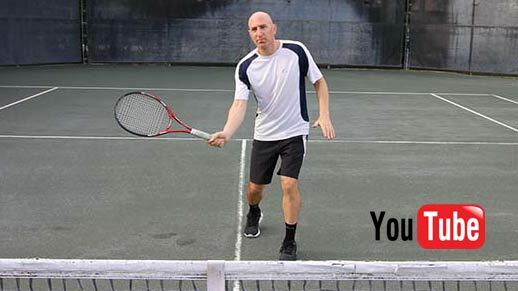 Your racket should flair out to your right (if a righty) and vice versa for lefties. Move your hand and racket upwards by bending your elbow joint. The racket will then move behind your head. Move your elbow higher up and use radial deviation to allow a full racket drop. For the sake of this exercise, allow the edge of the racket to touch your back. Your racket should be completely inverted at this point. Begin to raise the racket upward by straightening your elbow joint. It’s key here to bring the racket up on edge. Just before the racket is fully extended pronate so that the strings face the ball. Your torso should be slightly to the side. Once contact with the ball is achieved (there is no contact in this drill, you’re just visualizing it) continue pronating until your palm or the hitting side of the racket is facing away from you. You can stop there or continue the serve motion, following through at your side. This drill really helped me overcome my shallow racket drop. For those people with a “waiter’s” serve who want to transition to advanced serve, this drill will be indispensable to you. I would suggest doing as many reps as you want, morning and evening. You can also do this as a warm-up on the court when you do get to play. Even now, I’ll do 25-50 reps at a time while watching tennis on TV (I have high ceilings), just to keep my motion sharp. Will help players with a waiter’s serve develop an advanced serve. Will help people with a shallow racket drop to develop a deep one. Will add mph to your serve speed and with less effort. 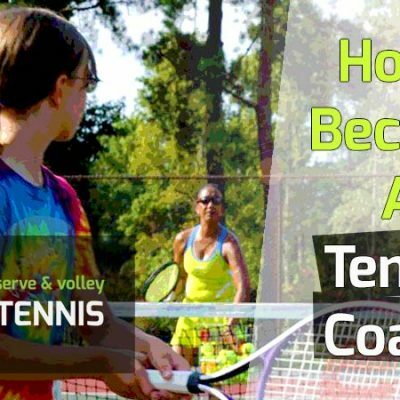 This is one of the oldest solo tennis drills but it still works great – especially for kids developing their game. It’s a little challenging at first but can be mastered in a short time. A racket and tennis ball. It can be done indoors or outside. Hold your racket, palm up, in front of you. The hitting side of the racket strings should be facing skywards. Bounce a ball off the strings as many times as possible without stopping. I consider this the forehand side. Pronate your hand so that your palm is now facing down. I consider this the backhand side. Now to try to do the same, bouncing the ball of this side of the racket strings as many times as possible. Once you master the forehand and backhand side, alternate between each one as the ball is in mid-air. Do as many as possible without stopping. For a little additional challenge see if you can also add in hitting the ball with the edge of the racket a la Roger Federer. Some children may find this drill difficult. In that case, you can have them do one hit, bounce the ball off the floor and then bounce it off their rackets again. They can keep repeating until they master this. Then they can try the regular drill again. Most kids master this drill after doing it several times. This drill is good for adults too and I still do it. Increases hand-eye coordination and builds up the forearm muscles. Also increases ball sensitivity on the racket and will improve feel on the volleys. This is perhaps my all-time favorite drill. 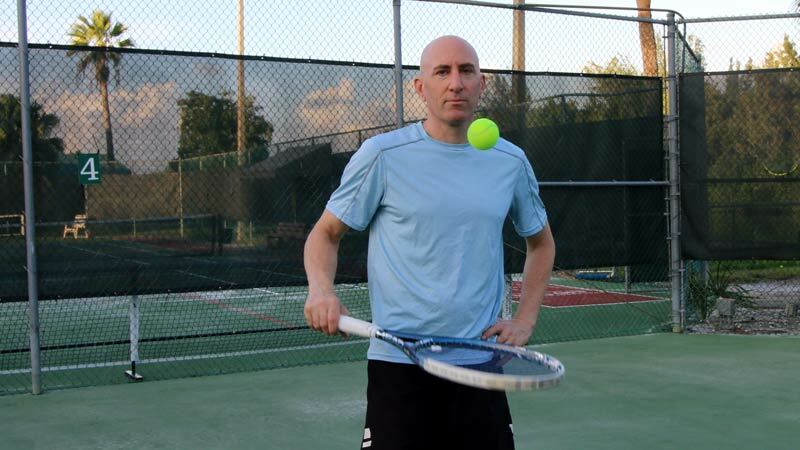 It improves your volleys and reflexes like no other drill. For this drill, you’ll need two people, each with a racket, and one tennis ball. Unless you have a huge indoor space, you’ll want to do this drill outside. Doing it on smooth pavement is the easiest. 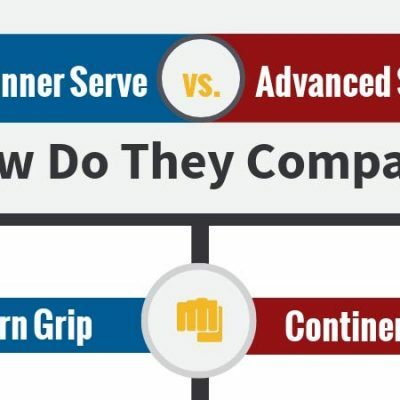 Make sure to use the continental grip. Stand about 15-18 feet apart, facing each other. Volley the ball to each other. Try to take the ball out of the air. If the ball hits the ground just half volley it and continue on. As you both build up feel, you can increase the pace or hit different spots. For example, do forehand volley to forehand volley. Or try going backhand-to-backhand. Try to keep the ball going as long as possible. If you get to the point of being super-advanced with this drill, you can alternate moving side-to-side while volleying. You can also make this drill a game. If you miss the volley you lose the point. Play games up to 11. This is also a wonderful game to do on court. If you want to know the specifics of that game, we discuss it in this post on volley drills. Advanced children can also play this game. It may benefit them to you do it with an orange or green ball, making the drill easier. Practice this drill 5-10 minutes at a time or even more. 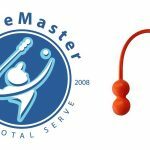 Improves volley technique and hand-eye coordination. If this drill is practiced consistently, it increases reflexes quite noticeably. When you can’t play tennis, doing shadow swings of your forehand and backhand can keep your form sharp and even improve it. This means your simply swinging the tennis racket with no ball. You can do these by yourself with only a racket. If you don’t have a racket, you can still perform them but it won’t be as effective. I’m a stickler for perfection on my strokes. I want my form to be efficient, effective and look great. By practicing shadow swings over and over, I can ingrain good habits and movements that are impossible when hitting a tennis ball. With shadow swings, I can slow my swing down, stop at any point to check form and even hold certain positions (like the power position) to impress it into my muscle memory. One caveat though. If you do not have good technique to begin with, shadow swings may not help you. You’ll just be reinforcing the same poor technique. In this case, I advise you to get a coach who can show you good form, copy your favorite pro player’s form, or watch a video tutorial on how to hit proper groundstrokes. I have a few helpful groundstroke videos on my youtube channel. Once your form is good, you can shadow stroke. You can do this exercise at home, but just make sure you have enough space. I once broke a lamp doing a forehand shadow stroke! I really like to do these in front of the TV when watching tennis. You can do them morning and night. From the ready position, start shadow stroking your forehand. Do at least 50 complete swings. You can swing slowly at first to make sure your form is grooved. Then gradually speed up the swing. You can use a racket weight to increase resistance. Next shadow stroke the backhand for at least 50 reps in the same way. Practice swinging for low shots, medium height shots and high shots. Make sure your feet are rotating. You can rotate off the front foot, back foot, both feet, or do jumping groundstrokes (for advanced players). You can also experiment with open stances, closed stances and neutral stances. I also like to shadow stroke my backhand slice. I suggest you throw in 50 reps of this stroke as well. Swing at different heights: low, medium height and near your head. If you have a lot of room, like a big garage or a studio, you can incorporate side-to-side movement with your shadow swings and even move back and forwards. Pretend you are playing points. For the best result, do at least 50 reps on the forehand, backhand and slice each morning (150 total reps). In the evening you can do repeat this. To really supercharge this drill, record yourself swinging, make improvements and then take video again and compare. 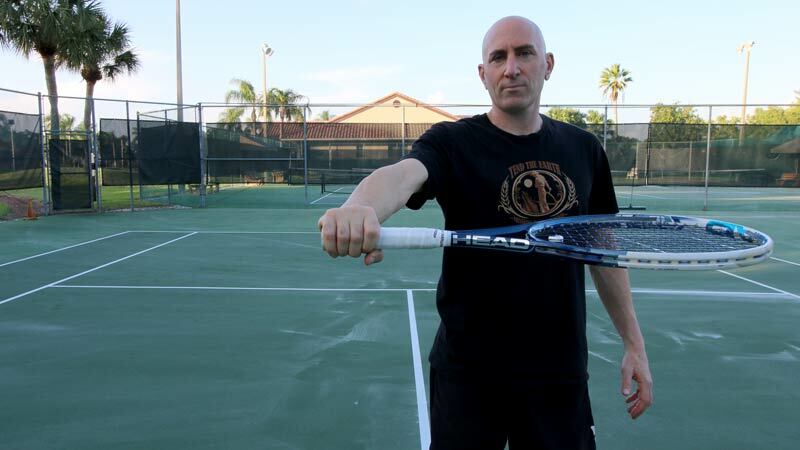 Improves your forehand and backhand form and groundstrokes. If you shadow stoke with a racket weight, you’ll be able to generate more racket speed, giving you more spin and pace on your shots. If you incorporate movement in the shadow swings, you’ll have better footwork on court. How many times have you walked backward to hit an overhead? And how many times did you miss easy overheads that ended up costing you the game and even the match? If the answer is “too many” then this is the drill you can’t live without. I’ve seen substantial improvements in my overheads with five minutes of practice in the morning and evening. Most club players lack good footwork on their overheads. Their swing path, timing and weight transfer are also incorrect. The purpose of this drill is to permanently etch good form in your muscle memory. By doing so, the overhead will become a shot you’ll actually want to hit. Only your racket is necessary — and you can even do without it in a pinch. Start in the ready position with a continental grip and turn to your dominant side. Get your racket up in the power position and put your non-dominant hand up towards the sky. The non-dominant hand serves as a guide to hit the ball and helps achieve balance. To hit good overheads we need to practice turning to the side and covering distance with cross-over steps – rather than walking or running backwards. At this point, you will begin taking crossover steps and go back about 3-5 steps (depending on the amount of room you have). When you stop and set up for the overhead (try to envision it), make sure your weight is on the back foot. Then initiate the swing with a racket drop and pronation, transferring your weight to the front foot. Complete the swing and then get back to the ready position. Wasting no time, move forward to the same spot you started in. By doing so, you train yourself to quickly return to the correct position and advance forward. This is by far the best drill you can use to improve your overheads. Practice it often but make sure your form is tight. Start off with 20 reps and increase to 50 over time. I would suggest doing 50 reps every day or every other day for two weeks. Then do it on a real court with actual overheads in practice until you are hitting the best overheads of your life. Improved footwork, especially at the net. You’ll also see a dramatic improvement in the pace and consistency of your overheads. If you watch professional players closely during a match, you’ll see they all pivot on their feet and rotate their bodies. They’re doing it nearly every shot to maximize power. However, most club players don’t pivot and rotate, or they don’t do it enough. Only your racket is needed. If you have no racket available, you can still mimic the movement in this drill. The pivot of the feet and rotation of the body are large factors in hitting fast, heavy groundstrokes. The discovery of this fact made a huge difference in my game. Once I began focusing on it, my groundstrokes really improved, especially when moving out wide. And that’s why I bring attention to it here. Trust me, if you want more power on your groundstrokes, few other drills compare! When playing there are four ways we can cause body rotation. I want to mention them first, so you understand the action steps in the drill. If you watch a professional tennis match, you’ll see the pros using all these rotations throughout the match. For them, it’s subconscious. They use the one that makes the most sense in the moment. But for us, especially if we have never thought about rotation, we need to practice it. Here are the action drills for pivot and rotation. Do shadow swings hitting only on the front foot – both forehand and backhand. You should be on the ball of your front foot, which acts as the pivot. Allow your body to swing around. The pivot and rotation occurs just before you would make contact with the ball. Shadow swing on the forehand and backhand side but use your back foot as the pivot now. The front foot should be completely off the ground. Shadow swing on the forehand and backhand side in an open stance and allow both feet to act as the pivot. The two-foot pivot can only work in an open stance. The jumping forehand and backhand are more advanced shots, so practice them if you have no joint problems or physical limitations. Do shadow swings with both feet off the ground. Remember that your torso needs to rotate in the air. I would suggest starting off with doing 20 reps of each rotation (10 forehand and 10 backhand). That would give you 80 reps in all. You can practice these once per day or once every other day. Trust me, they are going to be very helpful to you in generating a lot more pace on your groundstrokes. You can use the backfoot pivot very well when going out wide to hit a forehand. And you can use the front foot pivot on most of your backhands – especially two-handed backhands. Improves both forehand and backhand groundstrokes by allowing for a lot more power. 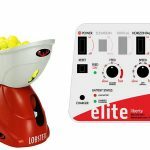 Also helps to improve footwork on the court and makes groundstrokes more efficient. 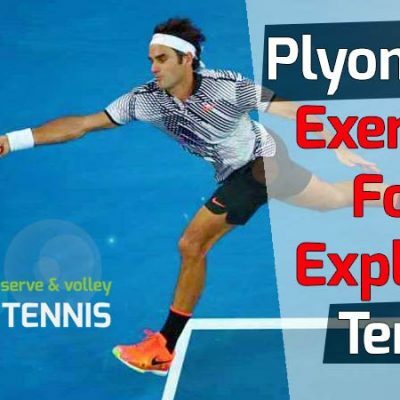 In this exercise, you’ll be practicing the five different volley types (we’ll leave out the combo types of swinging volley and overhead). It’s a very simple drill but will really aid your volley form on the court. It will also help you understand the five different volleys you can use at the net. If you don’t know what they are, I’ve listed them below with basic definitions. You can check each one out in detail here. Block Volley – As the name implies, you’re literally blocking the ball with your racket. There is no movement of the racket. Punch Volley – This is like a block volley, but you move the racket slightly forward and down to give it a bit more zip. Drive Volley – This is the longest swing path of the five volleys listed here. You can take the racket back just a little further, follow through a little more, plus step into the ball. Drop Volley – A volley where you “drop” the ball lightly over the net so your opponent cannot get to it. It’s like a block volley but with a lot more give in the racket head. Half Volley – Volleys that occur after the ball hits the ground. Typically you’ll be getting down low on these. 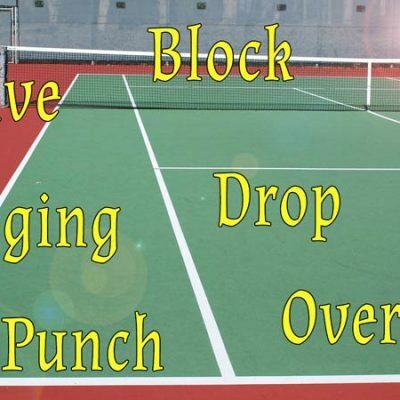 You can practice these at home with only a racket and your imagination. Now that you know the five basic volley types, we can lay out the drill. This drill may seem so easy that there’s no benefit. But don’t be fooled. This drill will really improve your volley game. I think of these as “shadow swings” but for volleys. After each rep is completed, quickly move back to the ready position and perform the next rep.
Start off in the ready position. Imagine a very fast paced shot is directed to your forehand side. Use the forehand block volley to return it (in your mind). You’ll then alternate to the backhand side. The key is to make sure there is no movement of the racket on the block. Begin in the ready position and do the same thing as in step one, but this time with punch volleys. Remember, the movement of the racket is slight. Try to really imagine the ball coming to you before you volley. Again, start in the ready position and then practice forehand drive volley swings and backhand drive volley swings. Make sure you are not taking the racket back excessively far. You should be stepping into the ball with your opposite foot (left foot on forehand side and right foot on backhand side). Start in the ready position. Pretend a ball is hit directly to your forehand. You’re going to block volley the ball but with a loose wrist and angle the racket up slightly to hit a drop volley. Imagine the ball pushing your racket back. Do backhand drop volleys as well. Assume the ready position. Imagine a shot is hit to you that bounces in front – called a half volley. For this exercise, you’ll need to really bend down (like doing lunges) to volley the ball. I think of the half-volley as lunges with a racket in my hand while doing a block volley. Perform forehands and backhands. Since these drills are not strenuous, there’s no rep limit. I would say 20 reps of each volley is the minimum you’ll want to do (10 on the forehand side and 10 on the backhand side). That would have you doing 100 total reps for all five volley types. The key on this drill is to use your imagination and use good form. If you practice these every day for a week and then come to net, you’ll see a very noticeable difference in your volleys. Dramatically improves forehand and backhand volleys. If you have a great imagination and can really visualize a tennis ball being hit to you, this drill can actually improve your hand-eye coordination. 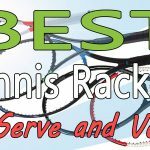 I’ve given you drills for improving serve, groundstrokes, overheads and volleys. I’m leaving the last one for footwork, which is extremely important in tennis. Tennis is a movement game, and if you’re not willing to move this game is not for you. With that, I introduce one of my favorite footwork drills for children and adults. 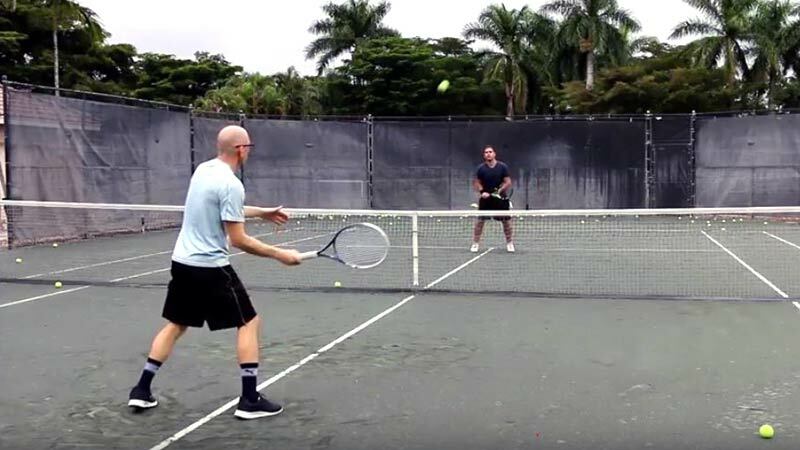 You’ll need two people for this drill and a tennis ball. 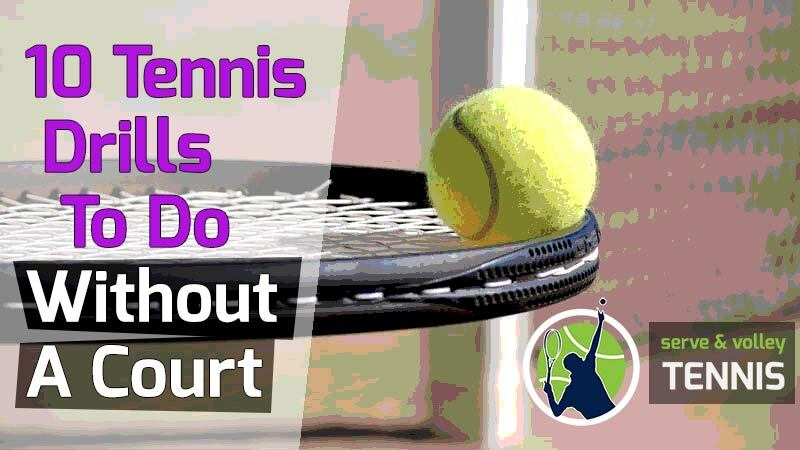 Optimally, you’ll want to do it on a tennis court when you have court time. But this drill can be done anywhere you have about 15-20 feet of space to move. Keep in mind the exercises require catching the ball on one bounce unless stated otherwise. Use proper footwork including cross-over steps, side-steps and always return to a ready position. Here’s how it works. One person will be feeding the ball. The other person will be performing the drill. The feeder will stand in one spot with the other person facing him or her (almost directly in front). The feeder will toss a tennis ball to their left side about 6-10 feet away. The performer will move to the side (their right side) and collect the ball on one bounce and then quickly return to the middle spot (from where they started). The performer gives the ball back to the feeder. The action is then repeated. 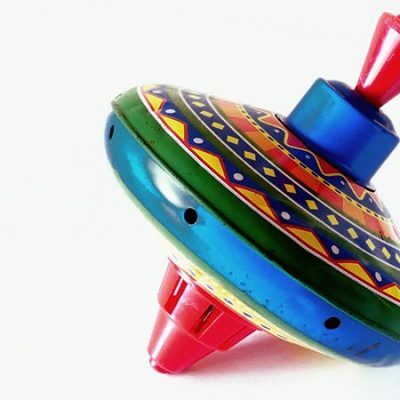 After tossing to the right side of the performer, the feeder will then toss to the performer’s left side and the process repeats itself. Once the feeder has tossed to both sides, here are some additional exercises you can do for this drill. The feeder can vary tosses to the forehand and backhand, making them random. You can make it a game and see how many catches the performer can make in 10 tries. Kids love games like this. The feeder can stand about 8-10 feet away from the performer (but still facing each other) and toss so that the feeder must back up to catch the ball no higher than chest height. This simulates backing up to hit a groundstroke. In the same position of being 8-10 feet away, the feeder can toss the ball near him or herself so the performer has to sprint in to catch the ball (on one bounce). The feeder can then randomize tossing in all four directions. A game can be made from this drill in many ways. As a feeder, I like doing random tosses in all four directions to the kids I work with. You can also toss the ball high and the performer needs to catch the ball in their dominant hand held up high (like they are hitting an overhead). This is the only time they will catch the ball out of the air. If you are doing this drill with kids, have them do a few reps to each side and then make a game out of the drill as I described above. For adults, it depends on their level of conditioning and physical ability. For someone young and mobile, 6-8 reps in each direction works with a 10-second rest in between directions. Improves footwork and quickness in all directions. Also improves conditioning. For this drill, you’ll need a wall, a racket, and a tennis ball. Simply go to a wall and practice all your strokes. Here is how I practice on the wall, which is typically a 25-minute session. I particularly love the wall for hitting volleys. Stand about 4-6 feet from the wall and practice forehand volleys first. Then do backhands. Finally, alternate between forehand and backhand volleys. I feel even a five-minute volley session on the wall improves my volley reflexes when on court. When hitting groundstrokes on the wall, make sure you are using your pivot and rotations. If the ball comes off the wall too lively, use a ball that is not new or less lively. This will help you etch good fundamentals into your strokes and improves conditioning. I’ve given you 11 practice exercises you can do without a court. Some are easier than others. Some require two people. But there’s no excuse for at least performing the solo drills at home in your spare time. The only drills that require two people are the volley-to-volley drill and the footwork game. You probably don’t have a wall at home either, but that still leaves eight drills you can practice at home or outside any time you want. The more you practice these drills, the better you’ll perform on court. If you can practice all the drills with the rep scheme I laid out once or twice per week, you’ll see amazing improvements in your game or that of your student or child. It takes hard work to be the best. When you don’t feel like doing the drills, remember that Roger Federer, Novak Djokovic and Rafael Nadal are all doing similar drills. If they need to perform drills at their skill level, how about you? If time is limited, choose the drill that can benefit you the most and perform it five minutes a day. Even 2-3 times per week will make a small difference but measurable difference in your game. Hey, thank you for reading this far. I appreciate you stopping by my blog. 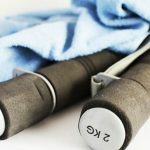 If you have any questions about the exercises in this post, drop me a comment below and I’ll respond. Thank you. We’re really glad to hear that. Yes, a racket review for baseline grinders is a great idea. We’ll look to write a blog post like that in the very near future.